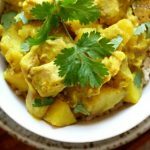 A thai-style coconut curry with moist bites of chicken, tender bites of yellow potatoes, vibrant turmeric and curry powder all made easily at home in your slow cooker. In your 4-6 quart slow cooker place the onions, potatoes and chicken. In a bowl, stir together the coconut milk, brown sugar, garlic, ginger, turmeric, curry powder, coriander seed, salt and red pepper. Whisk until combined. Pour the mixture over the contents of the slow cooker. Cover and cook on LOW for 4 hours (some slow cookers may take only 3 hours). Test potatoes for tenderness. Gently stir. Stir in the lime juice, if desired. Add in more turmeric and curry powder and salt to taste. Serve curry with cilantro over rice, if desired.